Water Leak at Meter. Sarasota Plumber or Sarasota Utilities? Who Do I Call? Home / Lakewood Ranch Plumber / Water Leak at Meter. Sarasota Plumber or Sarasota Utilities? Who Do I Call? Water leak at meter. Sarasota Plumber or Sarasota Utilities? Who do I call? When you see water coming out from your backflow device or you see water coming up from the ground around the water meter, it could be both a Sarasota Plumber and a Sarasota County Water Utility problem. The first thing to check is to see exactly where the water is coming from. If the water is coming from the big brass thing above ground, called a backflow device, you will need to call your Sarasota Plumber. 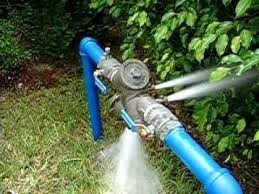 The backflow device is ahead of the water meter and it is up to the property owner to maintain the backflow device. The backflow device has seals inside of it that will fail. This is one of the reasons that Sarasota County Utilities wants you to have it certified once per year. Your plumber is the one to call for this. He can maintain it for you and insure that it is certified. If the water is not coming from the backflow device, but coming up around the meter box, pull the cover off of the water meter and determine if the water is coming from behind or in front of the meter. If the water is coming out in front of the water meter you will need to call your plumber. If the water is coming out behind the meter, you will need to call the Sarasota County Water Utility Department. If you do have a leak at the backflow device or in the ground at the water meter, you will want to get this repaired as soon as possible. Repairing it promptly will save you money. All the water that is leaking on your side of the water meter is being charged to your water bill. Save money, save water. Call a Sarasota Plumber when you have a leak. If you don’t have a Plumber, call Wimpy’s Dependable Plumbing. We can save you money. As our customers say, I Love My Plumber! Call today, 941-322-1911, or schedule online at www.Loveyourplumber.com.